Trash, Nuts and Bolts, and Fall Memories | All of This! I’m sure everyone has a favorite of this tried and true recipe. The one below is mine and quite a few others, so I thought I would share. This came to me via my Mom ( any recipe shared by her is always a winner !). This evokes a plethora of memories for me. Fall, always Fall; though this can obviously be prepared other times of the year, it is only prepared in the Fall in my household. This recipe evokes memories of tailgating and tennis season and going back to college. But mostly, it is the house full of kids that we had while my daughter was in high school. I loved having them come in and out and spending the night and spending the days, too, and laughing and crying and watching TV and experiencing all the trials and tribulations of those teenage years. I made batches of this stuff. It makes an enormous amount, and they went through enormous amounts. They always wanted a bag to take with them and when they grew up and went to college, they requested care packages of this mix. So, my house is emptier these days, but I continue to make this for the office staff and my friends. Of course, when my kids come home this is a staple they are counting on, waiting for them, as I cherish the sound of young voices permeating my home again, till it’s time to fill those “to go” bags and send them out into the world. 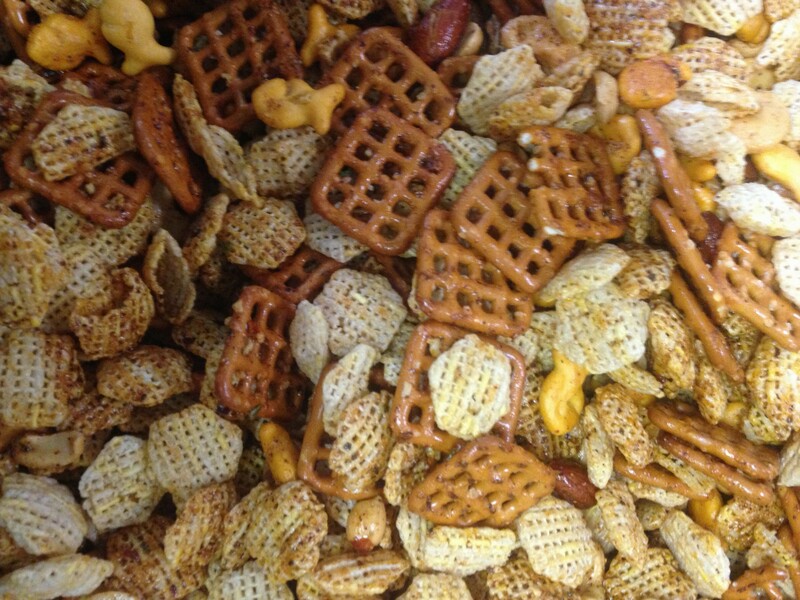 Combine cereal, pretzels, Goldfish and nuts in large roasting pan. Mix together the first seven ingredients and toss in the cereal mixture until all is coated. Bake 200 degrees for 2 to 3 hours. Stir occasionally. This entry was posted in Appetizers, Just for Fun!, Recipes by donnabgetty. Bookmark the permalink. Whoo hoo! My grandmother came to Massachusetts and made this for her disapproving daughter…her granddaughters loved it. Good choice! !